Tropes pertaining to arachnids, arachnid-themed characters and things often associated with arachnids. Sub-index of Invertebrate Index, and consequently Animal Tropes. See also Insect Index for tropes pertaining to another class in the arthropod phylum. The most commonly seen arachnids in fiction are the spiders and the scorpions (and, to a lesser extent, ticks), and thus most tropes on this page pertain to them specifically. The other groups of the arachnid family — the pseudoscorpions, mites, harvestmen, whip spiders, camel spiders and whip scorpions — are generally far less likely to show up, but do so from time to time. Despite the names, Spider Tank * an armored vehicle designed to walk in an arthropod-like manner on four or more robotic legs, but not necessarily looks like an arthropod, Demonic Spiders * frustratingly difficult video game enemies that may or may not be actual spiders, Spider-Sense * a psychic ability that warns you when something bad is about to happen, named after Spider-Man's iconic super-power and Stab the Scorpion * when one character seems to be about to attack another but is actually attacking a dangerous thing next to them that may or may not be a scorpion don't go on this index. All Webbed Up: The common fate of those unlucky enough to be captured by hungry spiders — being cocooned like a captured fly. Arachnid Appearance and Attire: Characters with spider-themed wardrobes and appearances. Cobweb Jungle: Cobwebs in abundance to amplify the fear factor. Cobweb of Disuse: How do you show that a place is old and derelict? Drape cobwebs everywhere. Cobweb Trampoline: Strangely bouncy and non-sticky spider webs used as trampolines. Friendly Neighborhood Spider: Spiders portrayed as friendly, well-disposed and heroic. 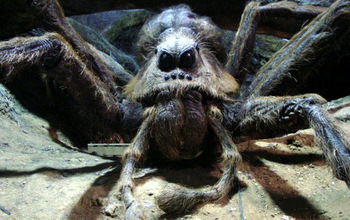 Giant Spider: Spiders large enough to pose a realistic threat to a human or whatever else the story focuses on. Poison Is Evil: Spiders and scorpions alike are often despised specifically because the poison in their bites and stings can sicken or even kill their victims. Projectile Webbing: Whens spiders, and sometimes other arthropods, possess the ability to shoot their silk ad webs like a ranged weapon. Scary Scorpions: Scorpions portrayed as terrifying, dangerous and aggressive, often far more so than they actually are in real life. Scorpion People: Scorpion-human mixes, often quite asocial and found living in deserts. Spider Limbs: Non-spiders with natural or artificial spider legs in addition to their regular limbs. Spider People: Human/spider Mix-and-Match Critters, often with a human-like torso and head mounted on a spider's abdomen and legs. Spider Swarm: Swarms of improbably social spiders moving — and hunting — as one. Spiders Are Scary: Spiders portrayed as terrifying, venomous and dangerous, often far beyond any threat they actually pose in real life. You Have to Burn the Web: Fictional spider silk and cobwebs are a lot more flammable than in real life.